Through Sisterhood’s Rachamim Committee, the women of Emeth volunteer for a month at a time to reach out to shut-ins and provide support to other members in need. Most of these efforts are not evident to the congregation at large but are valued by those who receive them. 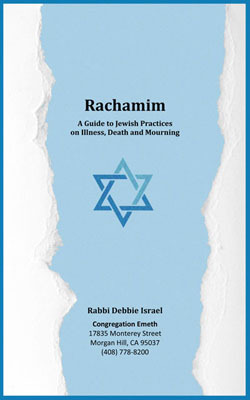 This Guide has been prepared by Rabbi Israel to help our members and your loved ones understand Jewish practices with respect to death, funerals and mourning. The Guide is intended for reading well in advance of death, when the mind is clear and the heart is not heavy. Read it, share your feelings with dear ones and discuss the issues that should be faced during life. This guide also will prove useful when death of a loved one approaches or occurs. Keep it where you will have ready access to it in time of need. Some of the traditions in this Guide will resonate with you, and some will not. Reform Judaism, with its special sensitivity to individual needs and preferences, empowers us to fashion a response to death that is personally meaningful as well as Jewishly authentic. There is no single correct way. The decisions are yours.